Anish Kapoor’s sculpture for De Pont museum in Tilburg is the first outdoor art project of Anish Kapoor in the Netherlands. Anish Kapoor was born in Bombay, India, but has lived in London since the 1970s. He is a Turner prize-winning artist who has exhibited his works in institutions worldwide including the Tate London, Kunsthaus Bregenz and Institute of Contemporary Art Boston amongst others. Tilburg, the home base of museum De Pont in the south of the Netherlands, is the first Dutch city that prides itself on having a work of Anish Kapoor in the public space. 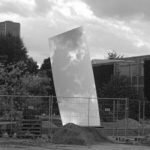 The ‘Sky Mirror (for Hendrik)’ sculpture, that Anish Kapoor created for the De Pont museum Tilburg, has been produced in 2017 and is a one of a kind art work in the ‘Sky Mirror’ series. Sculptures from the ‘Sky Mirror’ series are made of polished steel. 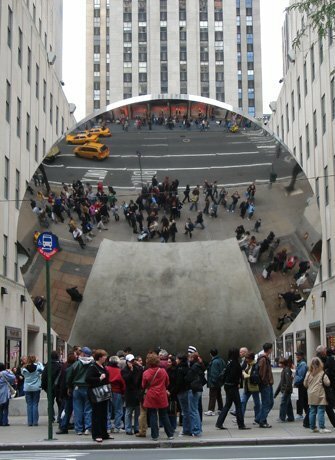 Since 2006 Anish Kapoor has installed several of these Sky-Mirror works in different parts of the world. The Tilburg Sky Mirror version ‘(for Hendrik)’ has been inaugurated on 17 September 2017 by the former queen of the Netherlands Her Royal Highness Princess Beatrix. 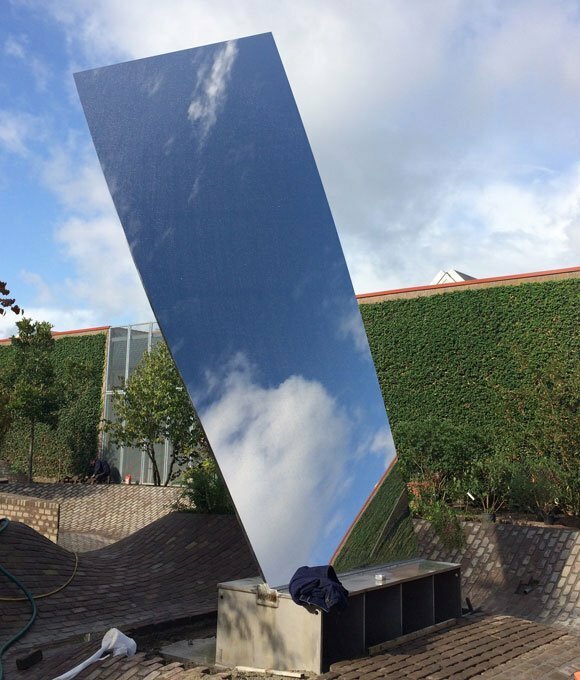 The steel statue is dedicated to the director of the De Pont museum Tilburg, Hendrik Driessen, hence the title ‘Sky Mirror (for Hendrik)’. Hendrik Driessen has a long standing working relationship with Anish Kapoor and the De Pont museum owns several works of the Indian born artist. ‘Sky Mirror (for Hendrik)’ is a highly polished rectangular sheet of steel, measuring 2 x 6 sqm. The metal sheet is slightly warped and hovers at a tilted angle of 30 degrees over a round brick pond that is linked to another pond made from the same material. The shiny sculpture mimics its environment and the framed reflections can be divided into two opposites; man-made and nature. Bricks and mortar whether pavement or building and air, water and surrounding plants and shrubs. The combination of these two opposites, and through Anish Kapoor’s work of art, one perceives infinite reflections and illusions of endless space. The amorphous form of the pond and it’s sculptural planted garden together with image of the infinite sky creates a fitting metaphor that redefines the entrance of museum De Pont. This sky reflecting sculpture is invariably open-ended. When one looks at it from the museum entrance side, it’s a mesmerising reflection of the sky, and an uplifting tune and a light experience. When walking around the sculpture a completely different apearance opens up. Standing between the carefully layout plants in many shades of green, a well defined dark shape comes into vision. This rectangular shape pulls darkness in, and it seems to intrude the environment like a mournful and misplaced tune. This view is in stark contrast to the opposite side. Instead of light, sky and clouds this side of the work touches upon a struggle. An encounter with an (inner) dark side that reflects the flip side of the self. It can easily become a tormenting experience that takes one unaware. Fortunately these gloomy dark patches that sprung into mind will gently flow away with time and with the water when we walk to the front again. There where we cannot help but contemplate further the movements of the mesmerising sky and reflect upon the self. 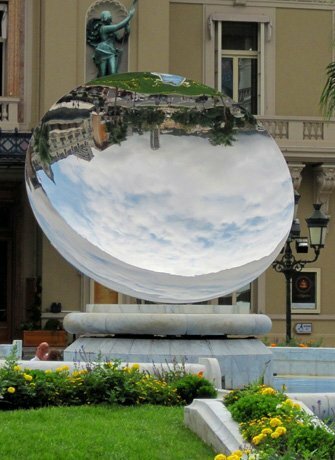 In self-portraiture, mirrors are commonly used by artists, and this Sky Mirror heeds another factor that seals a bond between an artist and a ‘looking-glass’ such as Anish Kapoor’s ‘Sky Mirror (for Hendrik)’. It is as if this sculpture’s objective is to hold up a mirror to man, reflecting a base by man made and nature infinitive space and therefore implying that the artist him self is a kind of mirror too. Although Anish Kapoor’s ‘Sky Mirror (for Hendrik)’ is a work of art that is modest in size, compared to some other works from the Sky Mirror series, it makes waves and it definitely demonstrates a lingering resilience for contemporary art in Tilburg and specifically for the De Pont museum now and in the future. Anish Kapoor not only creates mind shifting and large scale art works in the public space like the ‘Sky Mirror’ works, Kapoor’s oeuvre also includes free standing indoor sculptures, installations and three-dimensional works that adorn interior walls and corners. Over the years, Museum De Pont in Tilburg bought several works by Anish Kapoor works that are made of a great variety of materials like pigments, wax, polyester, stone and so one. One of the works is called ‘Vertigo’ (2006) and also made of highly polished steel. We captured this dazzling work on a video when it was just installed in the museum. As far as ‘Sky Mirror (for Hendrik)’ goes it is said that Anish Kapoor has not received an artist fee for this work. 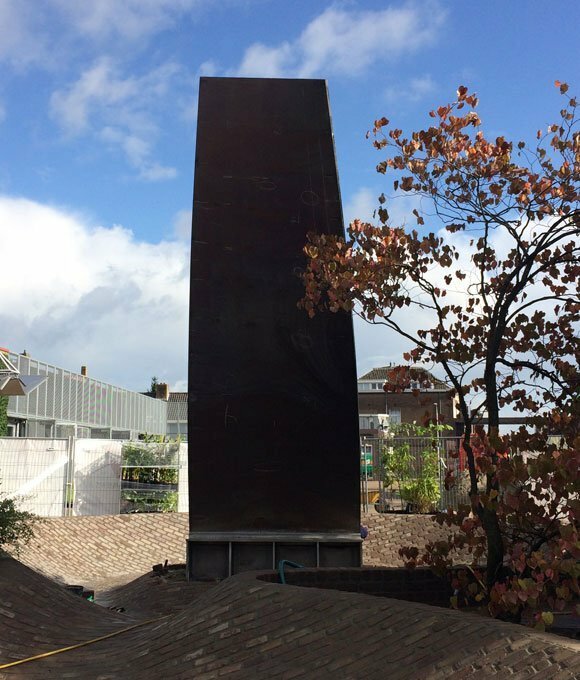 Anish Kapoor wanted to support the museum with this steel statue as he felt supported throughout his career by the De Pont museum Tilburg and in particular by it’s director Hendrik Driessen. The 500.000 euro production and labour costs were gathered together from donations from local businesses. The Tilburg city council and the Noord Brabant provincial funds also chipped in. The Sky Mirror series consists of large and medium sized, highly polished steel shapes like, hollow disks, ovals, rectangles and bend beans and trumpet shapes. The first ‘Sky Mirror’ (2006) has a disk shape and is placed in front of the British Nottingham Playhouse. It’s a commissioned work that has become the landmark of the Nottingham theatre since then. 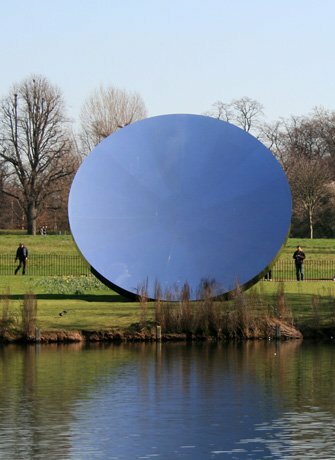 In collaboration between The Royal Parks and Serpentine Galleries in London, another edition of Anish Kapoor’s ‘Sky Mirror’ was exhibited in 2011. It was part of the ‘Turning the World Upside Down’ exhibition at Kensington Gardens. This ‘Sky Mirror’ edition is produced in extended shapes, including curvy and conical shapes in addition to the original round shape. Non-Object (spire) (2007) shows another shape of the precedent ‘Sky Mirror’. It is presented in a conical shape where it is blended seamlessly with the environment. Sky Mirror, Red (2007) is Kapoor’s experiment with colour-tinted steel reflecting the sky. The sculpture was exhibited in the pond of Kensington Gardens, also in London and it intrigued visitors have closer at the artwork. However, this red ‘Sky Mirror’ version has been criticised because the reflections are less powerful. The Dallas Cowboys Football AT&T stadium in Dallas United States, boasts a giant ‘Sky Mirror’. The 11,5 metre in diameter, stainless steel disk reflects Texas’ big open sky on its concave side and hundreds of thousands of football fans on the stadium side. The $10 million artwork (plus $3 for the surrounding black granite fountain and the labor it took to install it all) sits on a black granite plinth that elevates it just high enough that it can be seen from the nearby highway. In comparison the Tilburg Sky Mirror (for Hendrik) sculpture is more modest in size, but certainly not less powerful in its appearance.